One way we raise money for the Canine Distemper Fund is through the item sales. 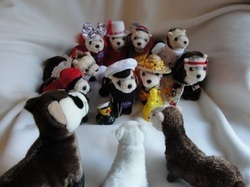 We offer a delightful array of plush ferrets that have been dressed by volunteers. 100% of the profits go directly to the Ferret Canine Distemper Fund. The plush ferrets available are in the Ferret Association of Connecticut's web store Ferret Treasures. You can see all the items available that benefit the fund including the dressed plush and place your order securely online.